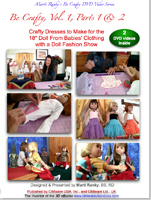 Contents: There are several volumes published in the Be Crafty Series containing different sets of dolls' fashion projects. This is Vol. 1. It has two parts. Part 1 teaches you how to make T-shirts, nightshirts and mini dresses. Then, how to transform an elastic waist skirt for your doll. Next is a no-sew blanket, followed by two projects for little brothers and sisters, while you do the sewing, also ideas about where to get inspiration from for your projects, and then finally tips and practical demonstrations on how to alter dresses. Part 2 is the fashion show, including Girls Night, Ballerina, Summer Camp and Birthday Party. Enjoy... The programs are designed to entertain the children while watching the dolls. Olivia, Isabelle and Molly help Marti with her fun designs. Marti shows how to modify baby and children’s clothing to fit your 18” doll. The instructions are clear, and easy to follow as every step is shown in detail in the video. She also uses very simple shapes, like the circle, the rectangle, and the square, as well as everyday items to make them into dolls’ clothing and interesting accessories. The Be Crafty Series encourages cooperation between generations using creativity as the bond. Suggested Viewing: Play full Part 1 video first, then watch the Fashion Show in Part 2, and then chose your project from Part 1. Marti Ranky, BS, is a Registered Dietitian (RD). She has created the Paint Your Meals video series. She is the author of Enjoy Nutrition and Students Can Cook DVDs. She thinks that arts and creativity should permeate every aspect of one’s life. For decades, she has also been a keen beader and a doll enthusiast. In the Be Crafty Series, she is eager to share her novel ideas, and artistic shortcuts with you, while making doll clothing and accessories. (You can contact her through the publishers: cimware@mac.com). Safety Statement & Disclaimer: The use of sewing tools, scissors, needles and electrical appliances should always be age-appropriate. Do not leave children unattended with sharp objects. Overseeing the activities presented in this program is the caregivers' responsibility. The publisher of this program declines any and all responsibility regarding the misuse of any of the tools or processes featured in this program. System Requirements: DVD-ROM: NTSC standard definition (SD) DVD video player for the USA version, or PAL for the EU version, TV, or computer. Approx. length: Part 1 is 63, and Part 2 is 19 minutes long, both in 16:9 wide screen format. Also available in PAL, in mobile device and HD formats (see below).